Live from Swaziland ... it's Saturday morning! : Burned baby to receive life-saving surgery - for free! 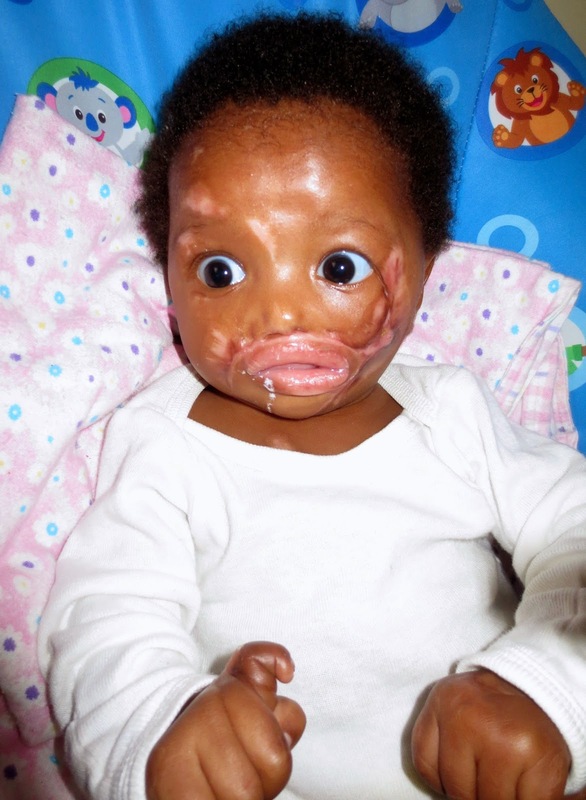 Burned baby to receive life-saving surgery - for free! Baby Shirley - photo taken November 21, 2014. In 2011 we attended the Healthcare Business Summit in Las Vegas as guests of MedAssets. That year the Dr. Norman Borlaug Humanitarian of the Year Award was given to Elissa Montanti, Founder of the Global Medical Relief Fund (GMRF). GMRF aids children who are missing or have lost the use of limbs or eyes, or have been severely burned, or have been injured due to war, natural disaster or illness. I sat in awe of Elissa’s courage, her tenacity and her commitment to helping the desperate and suffering children of the world. Elissa says, “What higher mission is there than aiding innocent, victimized children?” Preach it sister! I never imagined at that moment that I would ever be calling Elissa to help with a child who I knew personally (we had no babies at Project Canaan at that time). Two weeks ago I was on a plane from China to Taiwan and was praying about how we were to help Baby Shirley. Baby Shirley's mother dumped her in a pit latrine at birth and then dumped fire in on top of her to make sure she died. She has burns so severe to her face that she can’t breathe well and gets infections easily, putting her very life at risk (see blog http://janinemaxwell.blogspot.com/2014/11/short-and-sweet-baby-shirley-needs.html). I asked the Lord what we were to do? The private (and expensive) hospital didn’t want to discharge Baby Shirley until we had a surgical hospital lined up to do life saving surgery. Nothing could be done in Swaziland and she would need to go to abroad for even more expensive help. Just then, Elissa’s sweet face appeared in my mind and I KNEW that we had a solution. During airport layovers I crafted an email to Elissa and John Bardis (CEO of MedAssets) to tell them the story of Baby Shirley. When I landed in Taiwan I hit “send” and within an hour of me sending that email I received the most beautiful email from Elissa telling me that she had all the doctors to help! Once I had a passport for the baby, she would send me a letter that would enable us to get a Medical Visa for her to enter the US. GMRF would cover all costs AND they will provide any follow up surgery needed until Baby Shirley is 21-years old!! She would, of course, live in Swaziland, but travel to the US for follow up surgery as needed. The big money, top Surgeons, excellent hospitals, “US side”, part was “done”, but not the Swazi side. Swaziland has recently been labeled a “human trafficking hub” and there is a lot of suspicion around why people what to take Swazi children out of the country, especially to America. I fully understand the concerns and support the initiative to eliminate any trafficking of any kind. The battle was intense (and for many reasons I cannot share those details), but Jesus always wins. On my 51st birthday, after three weeks of team effort while I was in China followed by 20 solid hours of Ian and I in government offices on my first week back, we were able to get a Swazi passport for our beautiful 8-week old baby girl. I want to give a huge shout out to the senior staff at the Ministry of Home Affairs, who moved mountains to help us help this little child. Also the Consular at the US Embassy was not only sympathetic, but also pushed the Visa application to the top and personally completed it and had Baby Shirley cleared for travel. Photo taken November 21st at El Roi Baby Home after returning from hospital for pneumonia. Photo taken October 24th, when she first came to us. I have witnessed a lot of miracles in my life, especially living here in Swaziland, but this experience is right up near the top of the impossible, becoming possible, through the ultimate authority – the Creator of the Universe. Baby Shirley is back home with us now and is being kept in isolation to keep her healthy until she leaves for the US. She struggles for every breath and has great difficulty swallowing and keeping formula down. 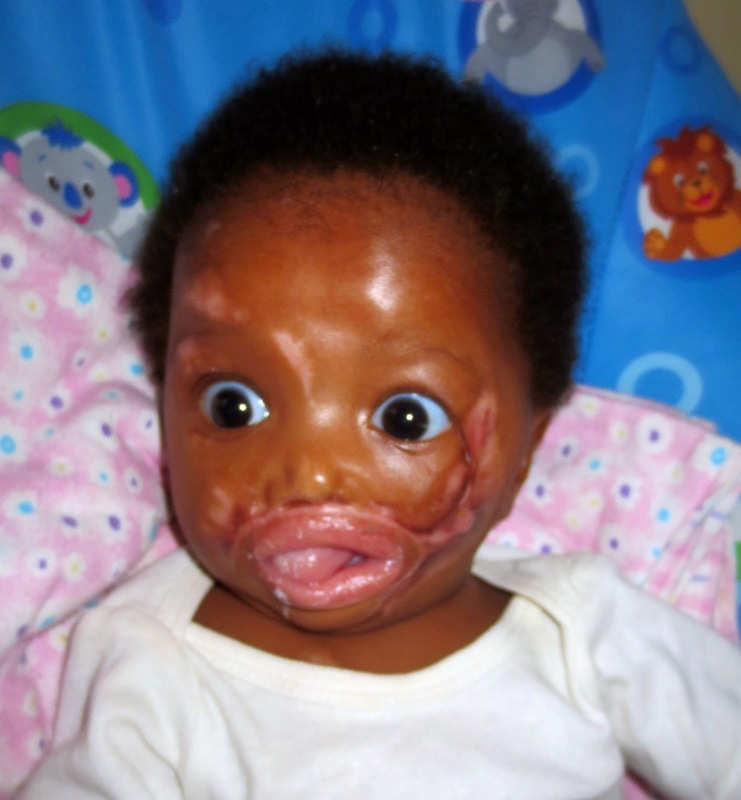 Baby Shirley will be there for approximately four months as they do reconstructive maxio-facial surgery first and then deal with digit amputations and other burn issues. And then she will come home to us to be loved and cared for by her new family. Thank you Jesus for providing hope for this child through Elissa and her team at GMRF. Thank you Jesus for John Bardis and our MedAssets family for their support of GMRF and Heart for Africa. Lord, as always, I stand in awe of YOUR ways. 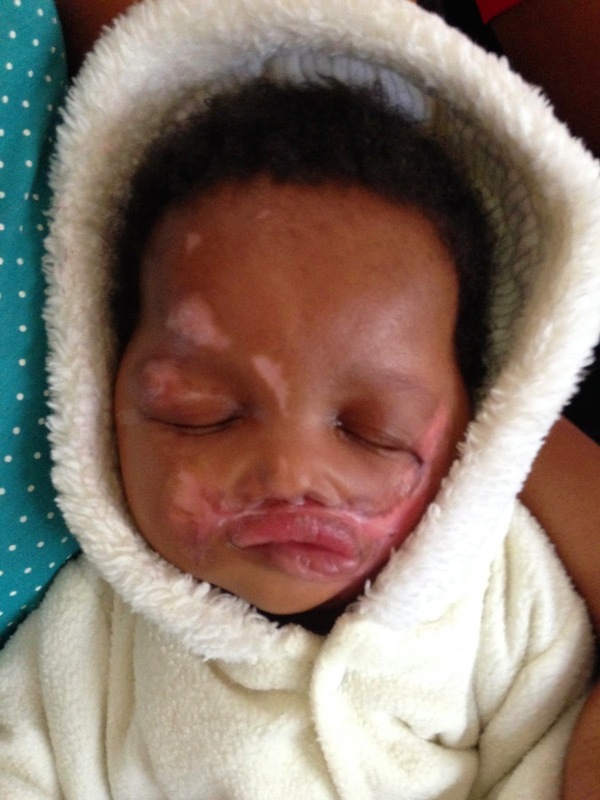 Live from Swaziland … I am praying for healing for our little one. Thank you for sharing this story of God's love and power and how it triumphs over evil. I will continue to pray for this precious and innocent life. She is only guilty of being born. Thank you for being His hands and feet in a dark world. Thank you so much for sharing! I have been thinking and praying for baby Shirley since the day I read your first blog about her. I was so sad...and angry, but now I am crying happy tears for the wonderful opportunities that God has given her. Thank God for Elissa and her team! i want to work with this team! may God bless each soul belonging to the team & the souls of those who have been assisted by this team. God bless you now & always. we need to hold hands even tighter as a christian global society, create a human circle so powerful that earthly forces cannot move us & cannot shake us. having the priviledge of doing God's work is a blessing only pure hearts can comprehend. Giving thanks for 3 things today. I really don't like when people lie to me.